Rising 650 ft., the 1180 Peachtree building is the most significant skyscraper constructed in Atlanta for more than a decade. The second LEED Core and Shell pre-certified Gold high-rise office building in the Southeast, it redefines the skyline of Midtown Atlanta. Situated at Midtown’s most prominent address – 14th and Peachtree Street – the building is located amongst the Woodruff Arts Center, the Atlanta Symphony Orchestra and the High Museum of Art. 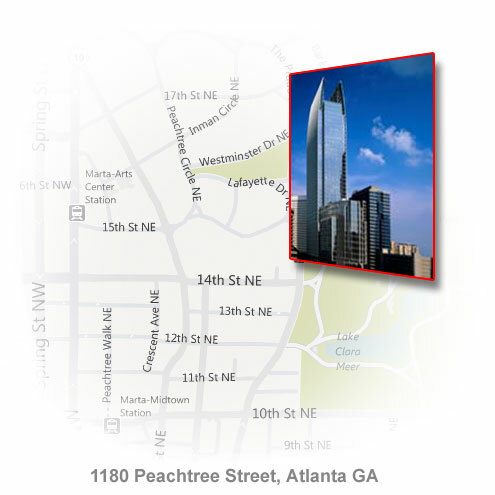 1180 Peachtree is a 41-story commercial high-rise consisting of 669,000 sq. ft. of office space and 25,000 sq. ft. of street-level retail space.Caldwell performed the mechanical and plumbing insulation systems on this highrise. We worked some 38,000 manhours of injury free time thanks to a committed supervisor and project management team. Our field and office worked seamlessly to see that not only did we meet the tight schedule but that our people returned home each night in the same shape they arrived in that morning. Caldwell installed some 210,000 feet of piping insulation and over 540,000 sq.ft of duct insulation in the construction of this tower.